1 20 oz. can crushed pineapple, DRAINED! Mix toether sugar, butter and cream cheese. Add pecans, crushed pineapple and packet of Ambrosia Dip Mix. Mix well. Put approximately 1 teaspoon of mixture between 2 vanilla wafers. Place on cookie sheet, cover with plastic wrap and freeze. Place frozen cookies in plastic bag or plastic container and store in freezer until ready to serve. 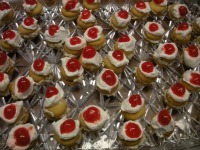 Place a small dollop of whipped topping on cookie and garnish with maraschino cherry before serving.